This should incite justifiable public outrage, and actually increase support for and awareness of the legislation among the grassroots electorate. A source knowledgeable about the ABA has also informed me that the organization’s Middle East law committee recently began a lobbying campaign, which the ABA’s international law chair endorsed. It was a political act, not a neutral study. This source sent me ABA policy guidelines that make it clear that policies that are formulated by small committees or “entities” can and do become official ABA policy under certain circumstances, and those circumstances are present in the case of this pro-Sharia Task Force. This puts the ABA on the spot: either its policy mechanism on Middle East law has been taken over by Middle East-based lawyer(s) with Islamic supremacist sympathies, or the Middle East law committee does represent the ABA’s actual positions. Further, is there any ABA group or task force assigned to helping those who oppose Sharia to craft legislation to ban it? No. There is only an initiative to oppose those fighting the Sharia. Particularly troubling is the non-democratic way in which the ABA made the decision to oppose the anti-Sharia initiatives of various states. A tiny minority of the ABA’s total membership steers its policies, which almost always are developed from the top down. The pro-Sharia initiative seems to have been pushed forward through what the ABA calls a “blanket approval” or even more rapid “technical comment” procedure, and seems to go beyond issuing mere statements to actively organizing lobbying to influence state legislation – a practice that is generally forbidden for tax-exempt organizations. 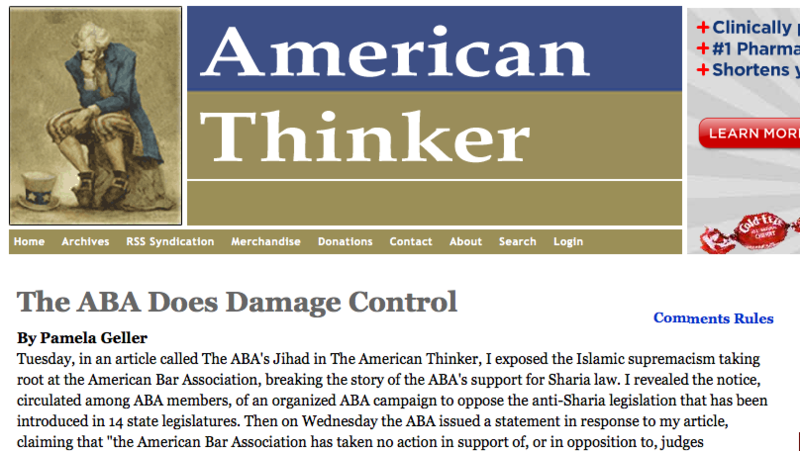 All this makes it obvious that the ABA’s statement disclaiming any support for Sharia was completely false and dishonest. If the ABA continues to forward this deceitful rhetoric, I will expose even more information about its support for Sharia. There is one way the ABA could make at least partial amends now: it’s time the ABA created a task force to help those of us who are fighting the introduction of Islamic law in America.